I travelled by air to Singapore. But what if one wanted to go from Europe by car? Recently a number of us trundled off to Singapore to attend the 100th Internet Engineering Task Force meeting, during which we shared our ideas on how to improve the Internet. But precisely how did we all get there? Why, by plane of course! In the case of yours truly, I went from Switzerland by way of Bangalore, India. 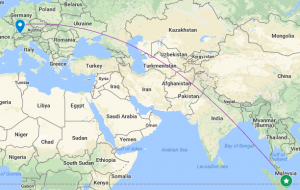 These are long flights: the short haul from Bangalore was four hours and twenty minutes. The non-stop return flight was just over twelve hours, thanks to favorable winds. But what if you wanted to drive? After all, instead of flying from San Francisco to Las Vegas, I drove; and I very much enjoyed the scenery. 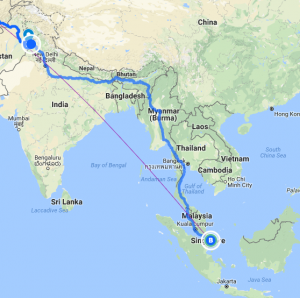 What would it take to get all the way to Singapore by car? Is it even possible? A little check on the map shows that it should theoretically be possible to travel the distance by land, with the occasional bridge crossing here and there. How would one even begin to plan such a trip? 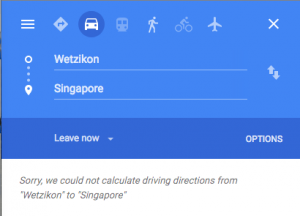 Well, for me it would be with everyone’s favorite navigation tool: Google Maps. We start there. There’s that inviting “Directions” button. If I just click it, I’m hoping that it will show me a few alternative routes, and a driving time. Of course it will indicate the tolls and the fact that we are crossing borders. Unfortunately, the invitation was quickly rescinded. What’s the problem? Well, like a good computer scientist I began to bisect the route to see if I could determine where Google thought there was no route. I figured, ok let’s see if I can get to India from Switzerland. I got the same answer. Well, very good! We’ve gotten ourselves half way there. To do so, we travel through Germany, Czechia, Poland, The Ukraine, Russia, Kazakhstan, Uzbekistan, Afghanistan, and finally into Pakistan. Right about now, Iran is beginning to sound pretty good, by the way. An airplane more so. Consider this little factoid: the route takes us through Eastern Ukraine which right now is not exactly being friendly with the rest of the country. It turns out that one can in fact cross the Pakistan/India border with a car at Lahore if one has all the right paperwork. One enters by the city of Amristar. Now let’s see if we can get from Amristar to Singapore. Surely enough, one can! That’s another 105 hours or 6,404 kilometers. One travels across India, avoiding both Bangladesh and Bhutan. While it is probably possible to drive into Bangladesh, Bhutan is virtually impossible to enter without serious amounts of paperwork. Of course, this whole trip would require serious amounts of paperwork, but Bhutan would require its own stack. One can do this because the Indian states of Assam and Manipur juts quite far to the east. 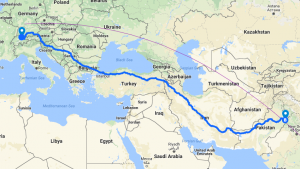 For those keeping score, this route is just under 14,000 kilometers, and would take, if driven straight, ignoring traffic (hah! ), about 200 hours. That would be about 25 days, if one limits one’s driving to eight hours per day. The route changes based on which citizenship one holds, to be sure. Many countries would require visas, and car permits. One challenge that one has to consider is that this is the most direct route, according to Google Maps. That doesn’t mean it’s the easiest route. 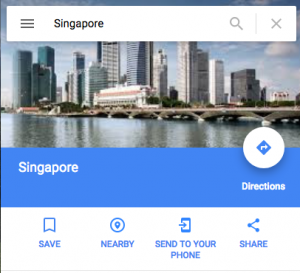 For one thing, many of the directions themselves, are written out by Google in the local script. For the Ukraine, that means Cyrillic. For Myanmar, that’s Burmese. Of course, this says nothing of the languages themselves, nor whether anyone would accept Mastercard. Hotels? There may be inns along the route. Google is pretty good at spotting these and (perhaps more importantly) gas stations. Having performed the exercise, I think it would be fun to do parts of this route. In particular, traveling in north-western India and into Myanmar seems interesting. I wonder what Hertz would say. Apart from the collision damage waver, and all other insurance, I’m pretty sure I’d want a very simple vehicle that could be easily repaired and could handle varying qualities of gasoline. An old Range Rover with an extra tank might be a good deal. Probably not the trip to take a Tesla. To play around with this route, have a look at the Google map. Be sure to expand out the directions. Note the occasional U-Turn one is required to make. Some final geographical points: this trip, while long, roughly follows the great circle route, and so it’s fairly optimal, from a distance standpoint. It is also probably the farthest south one can travel from Europe or Asia without taking a ferry. Assuming one can travel it at all. With ferries, it may be possible to get as far as Timur, but I haven’t checked that. This week I find myself in one of the chief Asian powerhouses: Singapore. I visited this tiny but hugely influential country fifteen years ago, just after having read another Letter From Singapore in the New Yorker magazine. Back then, the community seemed smaller and the businesses were lots more cozier. Today, the community seems larger, and businesses are still pretty cozy. Singapore is a nation state of paradoxes. Its small size would not lead one to believe that it is one of the chief trading centers in the region, with container ships constantly waiting to unload. That, by the way, really does seem to be one of the lone constants between now and 1993. The hotel I stayed in then, the Pan Pacific, was one of the taller buildings. Today it is in the shadow of many others. The city itself is difficult to evaluate this week because of an extraordinary event. They are hosting their first Grand Prix on the weekend, which will be held on the streets at night. It’s a first for Formula 1 and somewhat controversial. What is not in dispute is that when F1 comes to town to do a street race, everything gets turned upside down. Tonight, returning from dinner, with many street closures in order to form the racing circuit, my taxi took me through the connected substructure of many buildings to get me back to the Mandarin Oriental. We needed a residence pass just to do that. The hotel prices on Thursday night will increase from a seasonal norm of $300SGD to $1800SGD. This means I will be out of here on Thursday. Singapore sports a cross of many cultures, including Chinese, Malaysian, Bengal Indian, Japanese, British, and yes, some Americans. This intersection leads to a wealth of cuisine entertainment and education options. There is a disparity amongst some of the groups, and to be sure, not everyone here is wealthy, but for a tourist it represents an interesting stop in the middle of the Pacific rim, with Indonesia, Malaysia, Thailand, Vietnam, and Hong Kong, not far off at all, and Australia, an almost reasonable distance. The people here are extremely gracious and the service has been nothing short of remarkable. More on Singapore in a future note. The Internet is for everyone!